With Star Wars fandom so divided following the release of The Last Jedi, it brings me great joy to see at least one of the most recent movies in the Disney era can be both appreciated without any prior context (be it novels, animated series, or short stories), as well as sprout subsequent (or… presequent?) material that is at least as solid as the original piece. 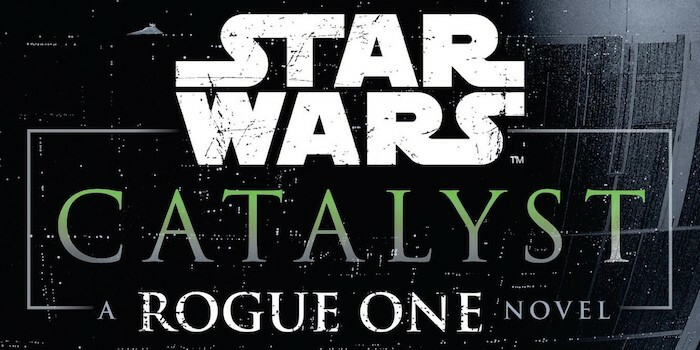 That, to me, is Rogue One, and this is James Luceno’s Catalyst, a prequel to the movie (including in publishing order) that I only managed to read after seeing R1 in theatres. Just how good is it? My thoughts on it follow, but safe to say this one gives 2017’s Thrawn a run for its money. First thing’s first: Lucasfilm editors (or whoever penned this), get your bloody timelines straight! But let’s not lose the plot… Catalyst burns through about 4 years’ worth of highly tumultuous Galactic conflict, even after the Separatists are officially defeated, an event that culminates in an all-out droid-fest battle in the end of the first part of the book, in one of the few bonafide action scenes in the entire thing. The story that longtime Star Wars author James Luceno pens may be likened to the prequels in a way - and the best way possible, I might add - in that they forego the grand galactic battles we’re used to dealing with in the universe and supplants them with a grand political scheme that adds much needed grounding to the opera. As a sucker for all the flash and bang of Star Wars myself, I never thought something like this would grip me as thoroughly. The story revolves around the ideological opposites of Galen Erso and Orson Krennic, both brilliant in their own ways, but while Galen employs his one-in-a-billion intellect to better the lives of others, from his own family to what he wishes will amount to an entire galaxy, Orson eyes the lofty heights of Imperial leadership via a clever use of wit, ruthlessness, charm, an analytic demeanour, and carefully delineated and used leverages when and wherever applicable. Their actions and personas are enhanced by the added layers brought by Lyra Erso and Jyn on one hand, and Wilhuff Tarkin on the other, with yet another smuggler-gone-soft in the form of Has Obitt spliced in the middle of it all, toeing the galactic conflict line, and whose fate intertwines with all of the above at one point or another in the novel. As Galen-centric as one might think this book is, after all it revolves around his Kyber crystal research that lead to the construction of the Death Star, I’ll commit the possible cardinal sin of arguing that for at least half the novel he’s the least interesting character we’re given. This isn’t to say he’s boring, but you have him pretty much pegged for the scientist aiming for the end-all goal in his mind, struggling to reach it by any means necessary, including familial relationships suffering for it. The most poignant idea in the first half of his arc is a much better conveyance of the “shades of gray” concept of the arms dealers we got in The Last Jedi with the Canto Bight scene (more on which you can read in the extended review we published way back when), with Galen choosing to work for Zerpen Industries, a company that did not take sides between the Separatists and Empire, but one that peddled wares to either for the duration of the conflict. The manner in which Galen’s desire to “do good” was overlaid on the effects of his work effectively harming millions is something that hits home much harder than the aforementioned big-screen scene. Meanwhile, Krennic has an end missing a means to it, and the path he takes is unclear most of the times, the reveals seeping into the narrative with hints and ideas he gets, mulls over, and then implements, oft times to great success. We see him orchestrate a new leadership for Geonosis before the Separatists are defeated, employing the bug-like race to work on the superstructure that would end up becoming the Death Star, an underlying plot that, along with co-opting Galen into the project, takes up most of his narrative presence. We get a great many negotiation scenes that build this arc up, with Krennic managing to enlist the aid (or at least approval for his actions) of people like Mas Amedda and even having a slow-boiling and highly enjoyable mind/prick-waving contest with the always ice-cool and composed Wilhuff Tarkin. Between this latter duel (in several scenes) and Krennic’s one man struggle to put Project Celestial Power together, Tarkin’s takeover of .Krennic’s (almost literal) baby during R1 is even more emotionally charged. I ended up getting fairly attached to Krennic although I didn’t lament his ultimate fate, his main characteristic is nothing but an egotistical thirst for power to match his brilliance after all, but I did very much appreciate the man’s work ethic and diligence in seeing himself achieve all that he himself knew he was capable of. Lovely stuff. Lyra herself is the spike of energy to Galen’s taciturn existence, an outgoing and adventure-loving kind (which we get a glimpse of during a couple of spelunky-oriented, crystal-analysing chapters), she is also of a mind that the Jedi were and still are a needed element to the galaxy, trying to follow their teachings in regards to how the Force governs life, although not being Force Sensitive herself. Jyn seems to be an extension of her, even at a young age, although we don’t get much of her aside from seeing her first steps, words, and customs as a toddler and small child. She’s definitely one of those never-cry babies that everybody wants to raise, though. There’s also a great sense of family throughout the novel, with Lyra and Galen always getting into the all-important “our future” talks that I, as a married man, can always relate to. Revolving around Galen’s ideals, but never losing sight of Lyra’s own plans as well as Jyn’s upbringing, there’s an astoundingly real feel to them, where even if the talks include sci-fi projects and outer space spelunky, you can still take a step back and go: “yeah, that’s exactly how these things are discussed within a marriage!”. Top marks for Luceno for getting this right and not devolving into a cartoon-ish representation of this aspect as many current books and comics revolving around geekdom seem to do. Has Obitt is also a multi-faceted, raw, unprocessed gemstone, with a streak of good running through him, yet the context of his existence forcing him to choices that some would call dubious and erring on the side of wrong. He’s more a passenger of powerful people’s will for the most part, but the way in which he manages to extract himself from the yoke of both Krennic and Tarkin and see his smuggling existence through is admirable and brought on by experience rather than thrown in just because it needed to be there. We get many sparks of brilliance in Luceno’s penning of both the leads as well as the universe at large, but the things that stuck with me the most is possibly the way that Krennic’s intensity and dry humour carried over into Ben Mendehlson’s performance in R1. A sly devil with great ambitions, Krennic benefits from knowing (or learning) exactly what makes Galen tick, and manages to lie or influence his way towards getting the Ersos stationed on Coruscant and working on a kyber-crystal-centric project that is passed off as a renewable energy endeavor. Lyra, to her great credit, is always wary of Krennic, always raising the issue with Galen and keeping a safe distance from being content with her husband’s relationship with the (then) Engineer Corps. Officer. This tension bubbles to the surface during a one-on-one in which Krennic takes a calculated but very high risk in threatening Lyra and Jyn (incidentally, the one time he calls the child by her name, a vehicle I think was used to further exemplify his seriousness and underline a certain tone in his voice at that particular moment), something that ends up factoring into the Ersos’ fleeing from Coruscant with the aid of a younger Saw Gerrera, someone that Has Obitt has a main role in acquainting the pair with. I thought a neat, if very short touch was also the way in which we were made aware of Rajtiri, a planet dubbed the smuggling center of the Galaxy, and its capital of Jibuto on which the opulence and pride of its inhabitants, even in death, was featured front and center via myriad displays and holoprojections adorning gigantic, lavishly built mausoleums and crypts, all for the scoundrels fallen on the altar of smuggling. As small as it was (as it stands, it’s still the one mention of Rajtiri in canon), it is this kind of world building that the book achieves from the get-go and keeps peppering the narrative with, but this definitely stood out and is something that I will keep pointing to when mentioning a Luceno piece. His attention to details to the point of reverence is something to behold. A small niggle I had that ended up hounding me for a few pages after I’d read it last, was the designation of the droid in the start of the novel, Assis, as an “it”. Traditionally within the universe, we’ve been dealt droids that are (programming-wise ) either men or women (R2 and BB included), something that gave them character, made them more relatable and easier to imagine the personas of. In the current social climate, I get the idea behind this move, giving each reader a wider choice of labels for the droid, but it ended up taking me out of the flow of reading every time the form was used, and it made the (very minor) character seem even more artificial than they obviously are. I’m willing to bet many people would like to dispute that point of view, but that’s a matter for another debate (maybe chat with to us over on our Facebook Group about it?). It’s very hard to distill the essence of awesome that oozes from every chapter of this work, and in penning this I hope I’ve covered most of the high points of it all, maybe even convincing some readers that Disney Wars isn’t all doom and gloom and is still capable of producing solid content, if brought about by authors of the “old guard”, people who’ve been doing this for decades and understand what makes both the universe and the fans tick. I cannot recommend this book enough, so much so that I’m almost jumping at the bit to read it all again just to soak up some more dialogue, character mannerisms, and the almost tangible evolution of the Empire following the events of Episode III. P.S. : After the recent release of the Darth Vader Annual #2 comic, there appear to be some discrepancies between this book and that one. And by discrepancies, I mean to say that Chuck Wending, author of DVA #2 and widely regarded worst current canon SW novel series Aftermath, has seen fit to go against canon over the last few pages of the book. Because reasons, and possibly he ran out of ideas for the final panels. This completely puts a spanner in the works, adding a new droid character that was at no time mentioned in Catalyst, as well as completely different reasonings for why Galen, Lyra, and Jyn end up running from the Empire in the first place. The fandom engaged him over Twitter, asking about the glaring differences, but as is his wont he merely resorted to snarling at his critics and calling them hateful instead of admitting that he just went off on a tangent and that (apparently) the Lucasfilm story team (and maybe the Marvel editor board) were on holiday while that particular one-shot was being penned. What this further exemplifies is that, even after nuking the EU for various reasons, some related to the fact that the canon was clunky and nonsensical, Disney-owned Lucasfilm managed to shoot themselves in the foot within 3 years of IP content. That’s gotta be some sort of record! As a final note, I’d like to share some Tweets that Chuck saw fit to reply to me when I pointed out his book was, indeed, highly disliked in the community. This, just after making the “I don’t care, it sold well” argument. All in all, if you ignore the canon screw-up and the dynamic between Tarkin and Vader that is completely removed from any logic we’ve seen, including the current Vader run that this takes place in, the #2 Annual is pretty much decent.